Techniques in Organic Chemistry 3 Edition Techniques in Organic Chemistry is the most comprehensive presentation of lab techniques available for organic chemistry students—and the least expensive. 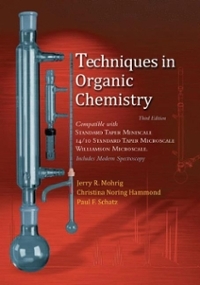 This book is intended to serve as a laboratory textbook of experimental techniques for all students of organic chemistry. It is written to provide effective support for guided-inquiry and design-based experiments and projects, as well as for traditional lab experiments. Techniques in Organic Chemistry combines specific instructions for 3 different kinds of laboratory glassware (miniscale, standard-taper microscale, Williamson microscale). It offers extensive coverage of spectroscopic techniques and a strong emphasis on safety issues. It can be used in conjunction with any lab experiments to provide the background and skills necessary for mastering the organic chemistry laboratory. The techniques manual may be purchased separately, or it can be packaged with either version of Mohrig’s Modern Projects and Experiments in Organic Chemistry or with an instructor’s own experiments through Freeman Custom Publishing.